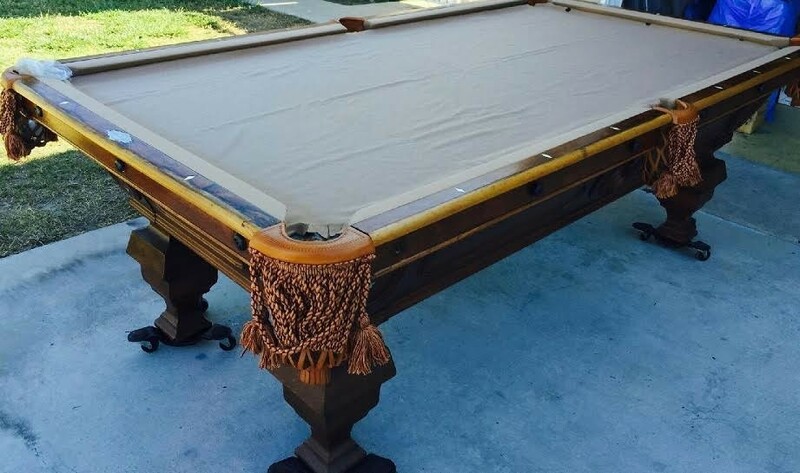 We sell high quality pool tables. 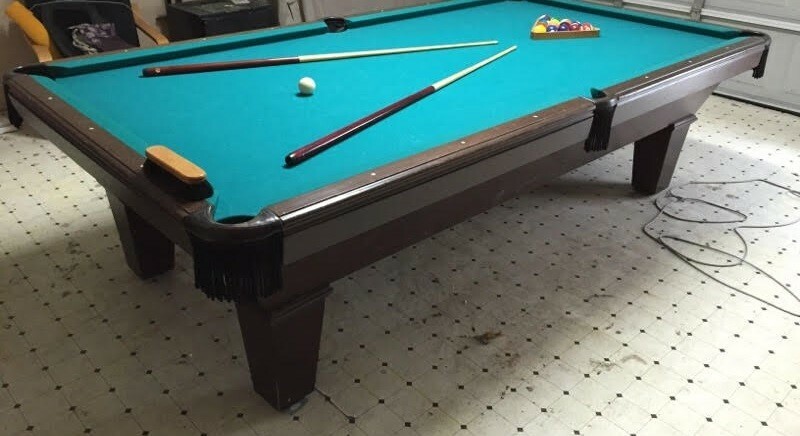 Even the preowned pool tables we sell are like new, after we're finished with touch up and any repairs needed. 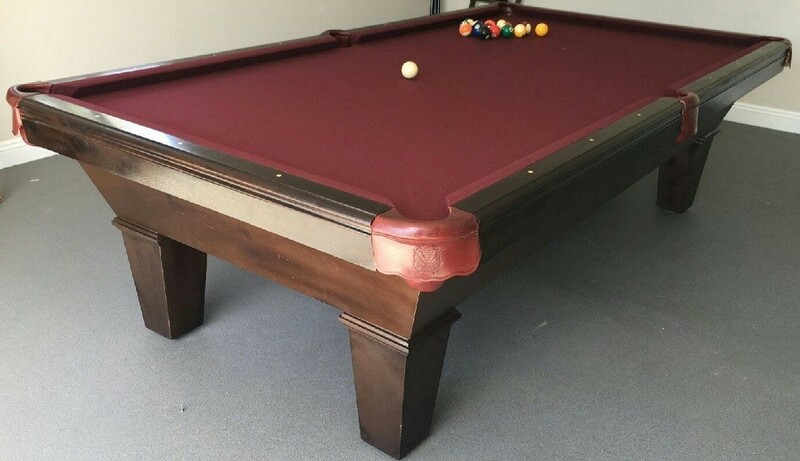 We changed the pockets and Felt on this beauty. 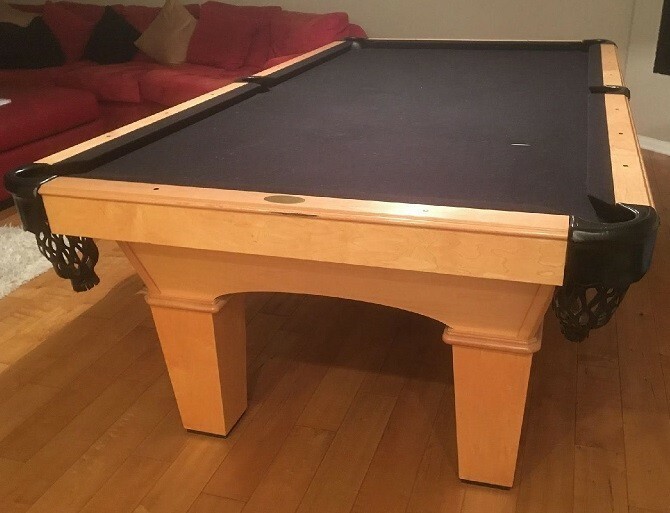 As you can see, this table went from a run down look to a fine piece furniture after we finished. 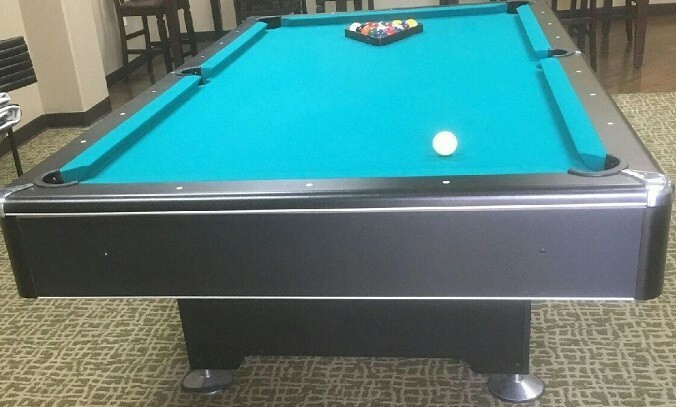 We moved this table from one home to another and installed new black championship felt. 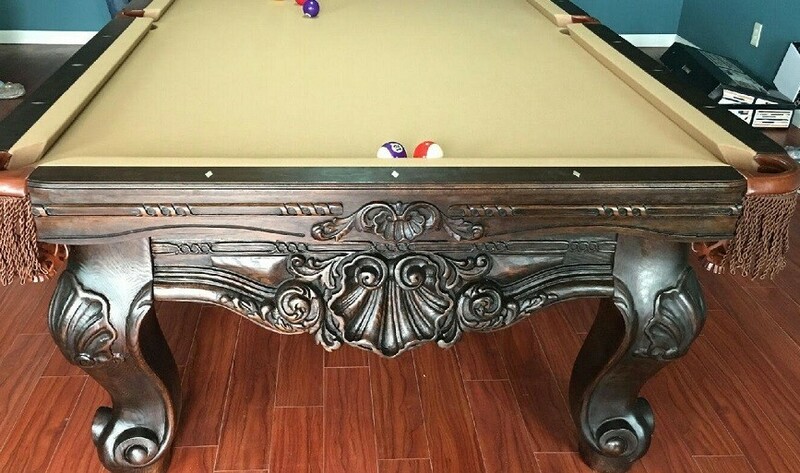 As you can see this pool table had some amazing detail. 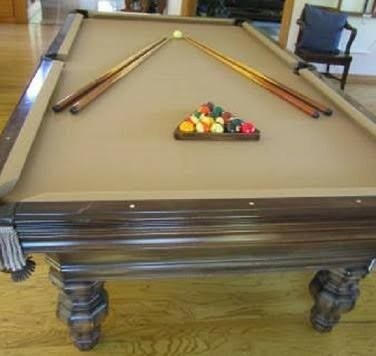 We purchased this beauty from a moving sale, did some minor touch up and refelted with championship cloth in Khaki. 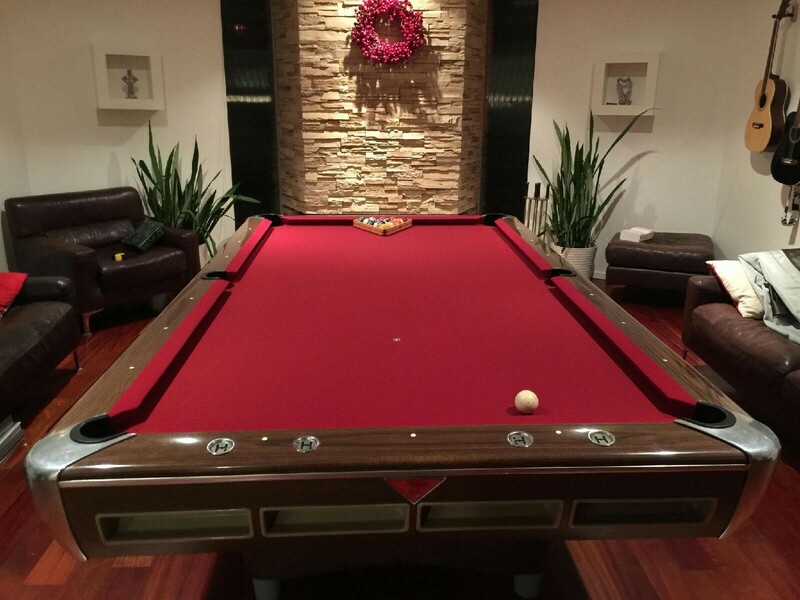 The finished product was stunning! 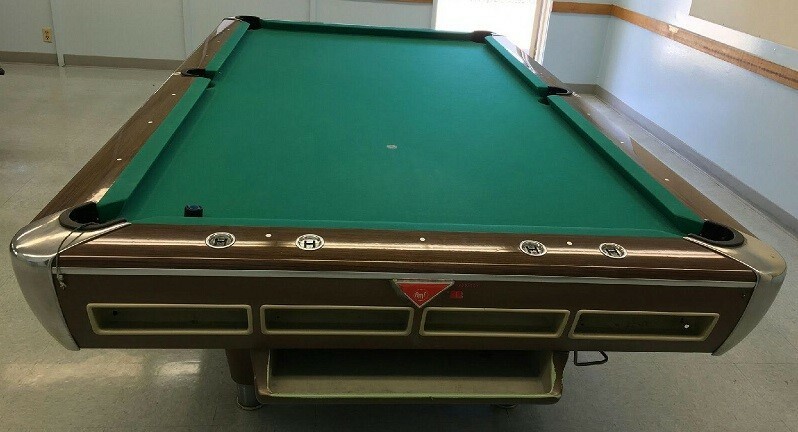 Another beauty that just needed a little tlc. 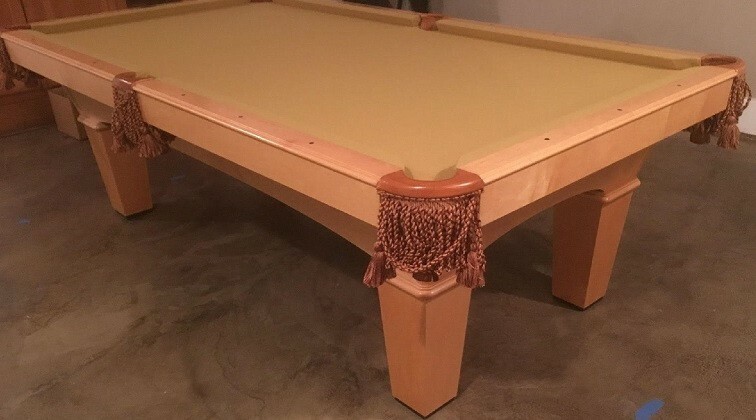 We did some minor touch up and refelted in camel. 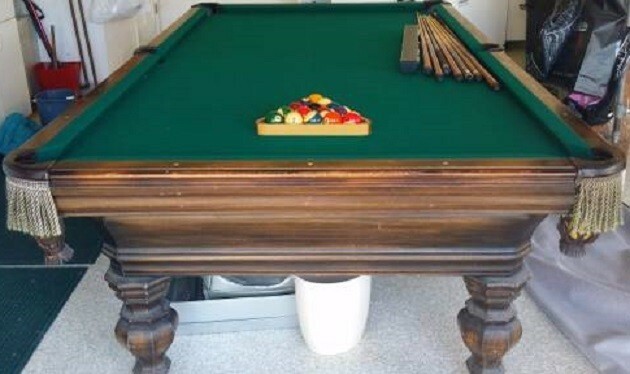 Don't be fooled by the age of a pool table, we can restore. 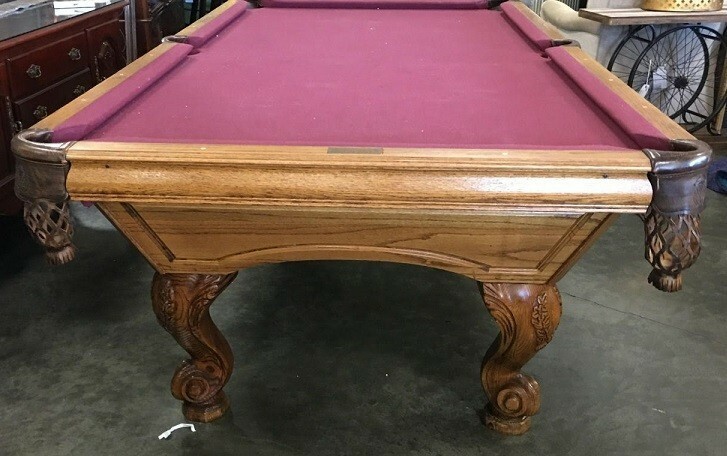 #6) TAUPE REFELT 8ft Antique Brunswick Pool Table Refelt / Minor Refinish / Pocket replacement﻿We moved this Antique Brunswick pool table from one home to another. 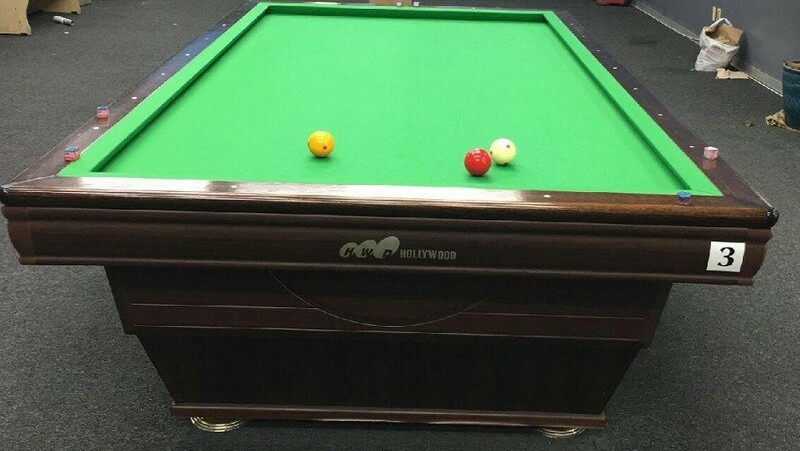 We then replaced pockets, and did a complete refelt. 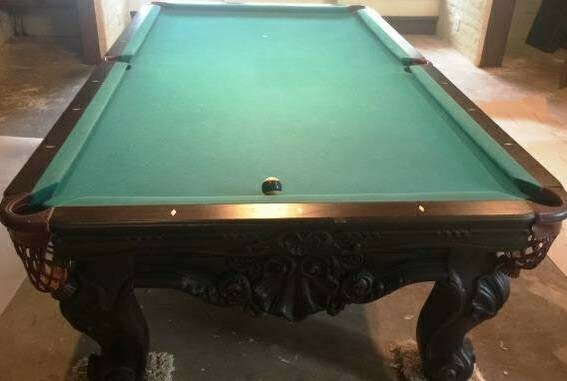 a fine Antique piece by Brunswick ! 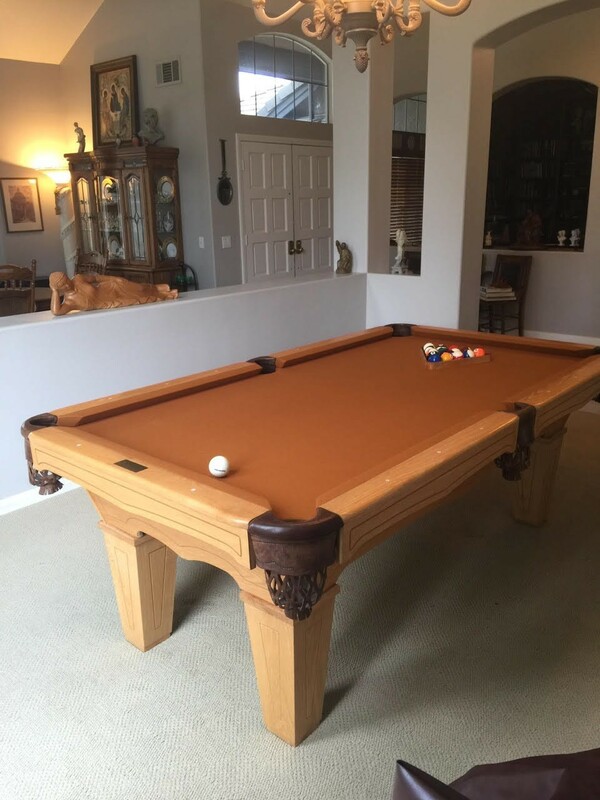 #7) ENGLISH GREEN REFELT﻿ 9ft Carom Billiards table - "3 cushion game "
We moved this Carom billiard table from one home to another, removed the old mint green(left) and refelted a beautiful english green. 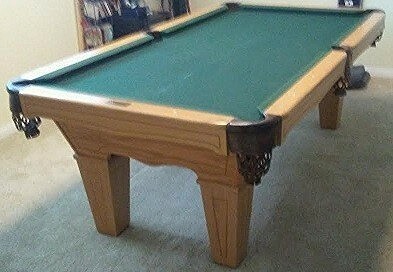 We moved this table from one home to another and refelted. Rust went perfect ! 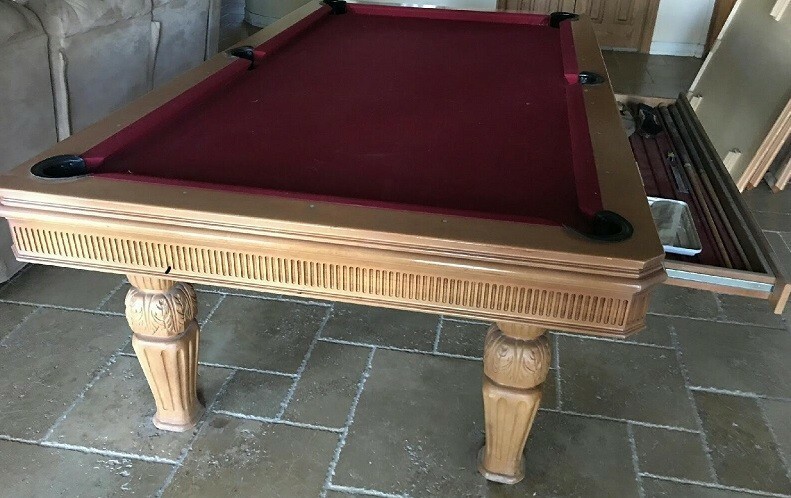 We moved this carombola table from one home to another and did a complete refelt.﻿ it's a pocketless billiards table played with different point scoring rules. 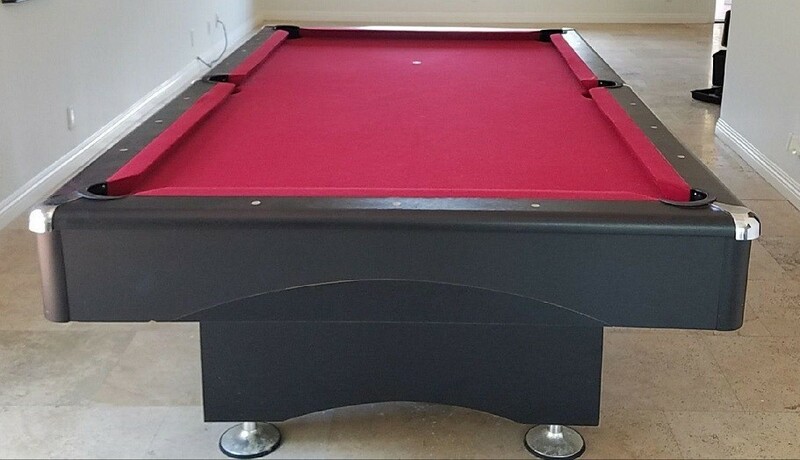 moved this eliminator pool table from one home to another, removed the worn red felt and refelted in a vibrant standard green. 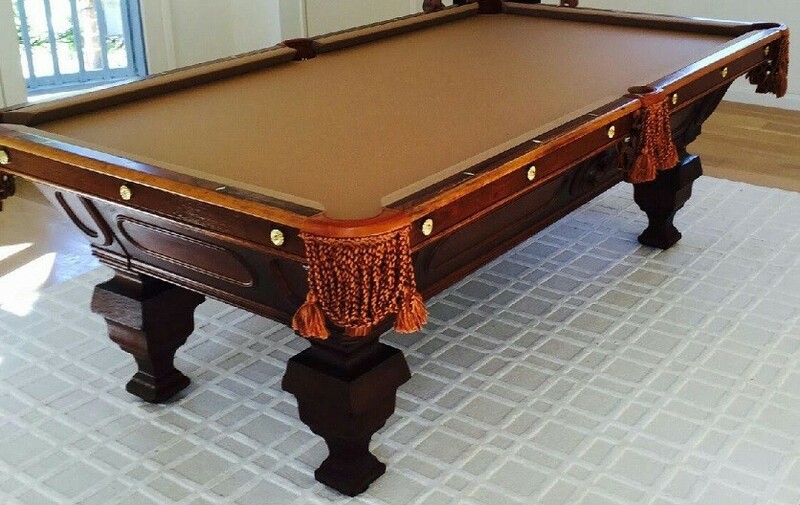 A beautiful preowned Olhausen pool table we recently sold. 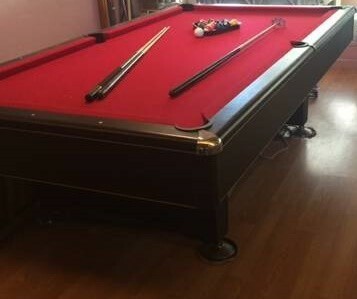 Had a black felt top, changed to a Golden. 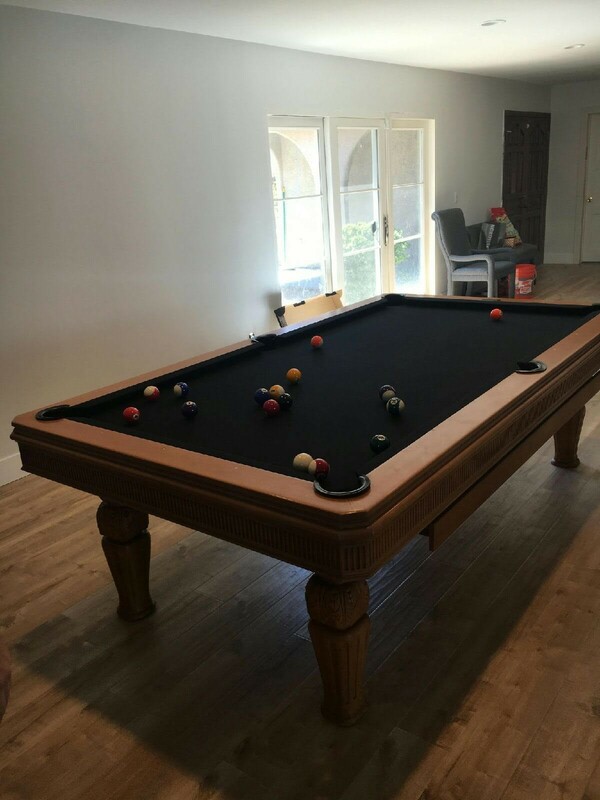 Below is a beautiful dark wood Fischer pool table we recently sold and delivered a client in Los Angeles. 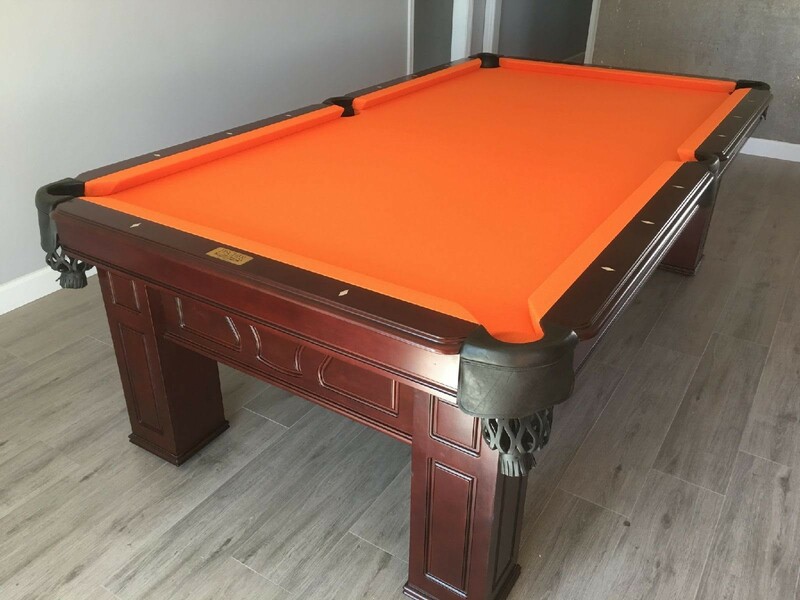 We removed the old burgundy felt and replaced with a brand new orange. 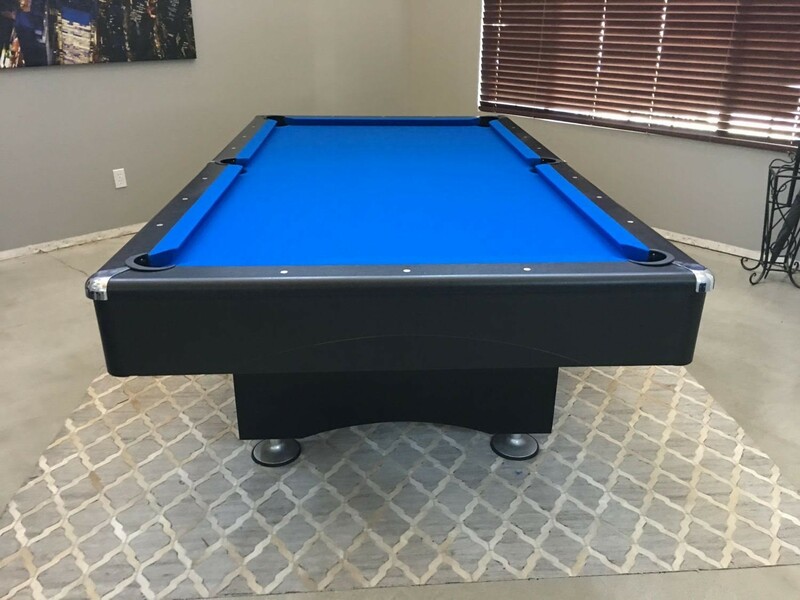 When looking for a blue that really brightens up your room, Euro blue is always a sure bet! 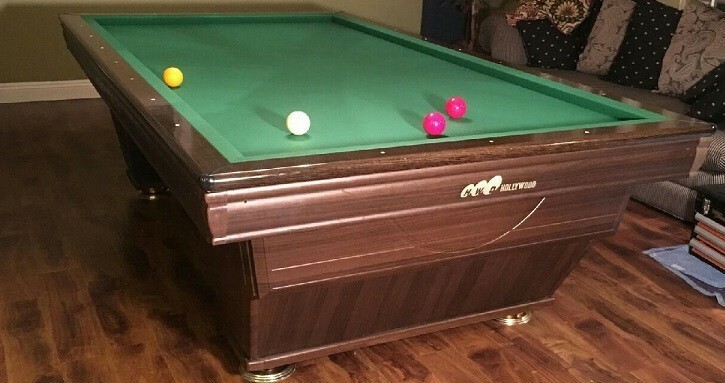 We recently moved this pool table from one home to another, did a little touch up and refelted..
removed the old faded burgundy and replaced with tournament green.